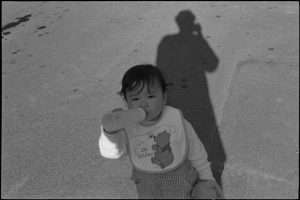 When I used to photograph only with film, I should dedicate all of my darkroom time to “work.” Of course back then, I photographed a lot of my family, friends and all, but I could not really spend much time for printing those. Darkroom work was so energy-consuming and professionally precious. When I lost my darkroom three years ago, finally I could make myself some time to look at those “family, friends and all” photographs, and scan them. Some of them were almost twenty years old. They became to own another meaning even for myself. I felt sorry for my family and friends, who eventually had a chance to look at those photographs much later.